The BC south coast has started the new year under a blanket of mist. While autumn is considered to be official “fog season” in the province, the natural phenomenon can persist at any time of the year and occurrence is highly contingent upon region. For instance, fog along the Vancouver Island coast is very common in the summer. Then there’s Greater Vancouver, which ranks third among major population centers in Canada, with fog reported on an average of 62 days per year. BC is also home to the Canadian city with the least amount of fog, with Penticton (Okanagan Valley) reporting just 4 days of the pesky haze per annum, which we suppose is only fair given their vulnerability to seasonal wildfires. While fog provides for mesmerizing photographic fodder amidst our province’s breathtaking natural backdrop it also makes for an uneasy experience on the road. Today, Park Insurance is here with some sound advice on how to drive safely through the unpredictable yet highly visible mass of condensed water vapor. Fog is a sneaky beast that creeps up when many people least expect it. The problem, is that your smartphone weather reading may say sunny skies are on the horizon for the day, and you’ll hit the road with confidence until all of a sudden you find yourself surrounding by a dark grey mist. Avoid this by subscribing (via email and SMS) to weather alerts for your locale at the very least through the autumn and winter, and all year long if you live within the BC West Coast Fog Zone. Also monitor weather reports for the regions you will be driving through and to. For example, you may live in a BC area without significant fog (i.e. Penticton) but your journey will have you heading into one of the worst (Greater Vancouver). Why drive on the frost-covered roads of the Coquihalla during a fog advisory if you can delay your trip for a day or two in order to err on the side of caution? 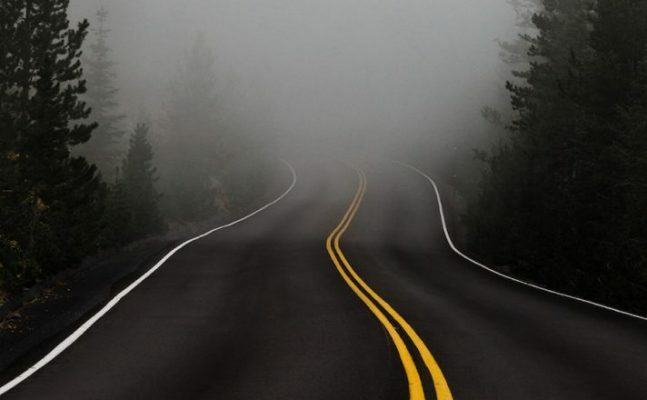 If you are stuck driving in fog, don’t try to beat it by driving faster to your destination. Even normal speeds are dangerous during foggy conditions. Be patient, slow down, avoid distraction, and focus on the road. If drivers behind become impatient, make room for them to pass and maintain your course until the mist dissipates or you reach your destination. There’s a good chance that others on the road will be driving slowly too. When driving behind them, allow them extra space, giving a 4-5 second distance so that you have time react should they need to stop suddenly. If they are driving too slow for comfort, resist the urge to pass them until fog clears because low visibility means that you won’t see vehicles coming down the road in the opposite direction, nor will you see if there are other vehicles in front of the one you feel like you’re tailgating. For some drivers, intense fog on the highway is too much to bear. Find a safe place to pull over such as a designated rest area or gas station lot because the side of the road is a hazard during bouts of low visibility. Keep your hazard lights on if in a rest area, as others may pull over and not see your car without lit assistance. Make sure you do your research ahead of time so that you know where rest areas are located along the way. That way you will have an idea of how much further you need to go when conditions are too concerning to continue. Fog is harsh enough on visibility, so don’t give it a helping hand by allowing your windows to fog up too. Before you begin your trip, clean all windows and scrape off frost as needed while checking the working order of wipers and washers. When driving, use your defroster to keep glass clear and if necessary, crack open a window just enough to provide adequate ventilation. The latter also means you (and each passenger) will need to pack an extra layer of clothing when fog is forecast for your journey. BC drivers have a lot of questions about what is and is not permitted when it comes to fog lights/lamps, especially when they have purchased a newer model vehicle with more robust bells and whistles, including rear red fog lamps. According to the most recently updated BC Motor Vehicle Act, including amendments up to December 2018, a vehicle may be equipped with two fog lamps, capable of displaying only white or amber light, mounted on the front of the vehicle below the headlamps. A driver may use fog lamps instead of headlamps when atmospheric conditions (i.e. fog) make the use of headlamps disadvantageous and the alternative assists with visibility. In such a situation, you are permitted to turn your headlamps off and only use your fog lights. If you plan on installing fog lamps, be sure to follow the strict positioning guidelines set forth by section 4.11 of the BC Motor Vehicle Act. If you live in BC be sure to have an independent broker review your automobile insurance to ensure that you’re prepared for the accidents (and liabilities) that may occur due to natural phenomena and person-made events alike. Contact Park Insurance today.